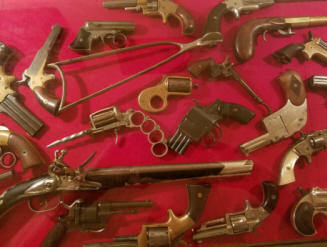 DRISCOLL ANTIQUES has been consigned to sell a large collection of Antique weapons, collectable knives and antique clocks. The owner has been adding to the collection since the early 1980’s. There is no interest in the family to carry on or maintain the collection. The owner has decided to find fellow collectors around the world that would cherish and appreciate the rarity and quality of the items in this collection. The majority of the pieces in the collection are in good to excellent condition and most are in working order. 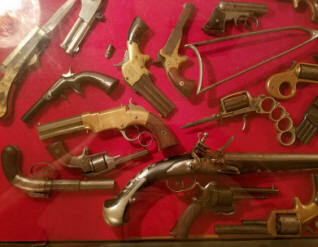 The owner has verified that the antique guns have never been fired as long as they have been in the collection. None of the collection was affected by Hurricane Katrina that hit the gulf coast in 2005 but all of the documentation on the collection was lost. Some of the rarer items are currently not priced on the web page due to the lack of available research. We will entertain any offer that we deem to be reasonable. DISCLAIMER: All firearms are sold as collector's items only - we do not accept responsibility as to the shooting safety or reliability of any antique firearm. All firearms are described as accurately as possible, given the restraints of a catalog listing length. We want satisfied customers & often "under" describe the weapons. 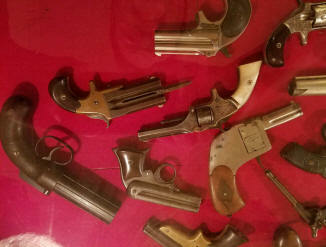 Any city or state regulations regarding owning antique firearms are the responsibility of the purchaser. All firearms are "mechanically perfect" unless noted, but again, are NOT warranted as safe to fire! All fire arms produced after 1898 will have to be transferred through a Federal Firearms Licensed dealer.